As Fabienne tells Butch in Tarantino’s Pulp Fiction, “Any time of the day is a good time for pie.” This is especially true when one is nursing a broken heart and in the first English language film from director Wong Kar Wai (one of Tarantino’s favorite directors), while love sick alcoholic police officer David Strathairn opts for shots and Otis Redding’s "Try a Little Tenderness" in a Memphis bar, beautiful singer Norah Jones decides on pie in New York with Jude Law in My Blueberry Nights. Gee, no offense to Redding and Strathairn but that seems like a no-brainer to this filmgoer as well, although like Ms. Jones and Mr. Kar Wai (IMDb), I’m not one for blueberry pie. In her screen debut, Jones turns in a subtle, introspective and competent if admittedly unchallenging performance as Elizabeth, who, heartsick from her badly ended love affair with an unfaithful boyfriend, begins returning to the diner where she not only learned of the infidelity through the loyal owner Jeremy (Law) but also has offered up her keys as the latest set to fill his cookie jar of failed romance. Jeremy, who serves as the genial but unlikely go between for bitter exes, is all too familiar with Elizabeth’s story as his keys were one of the first ones dropped into that sad jar and while nobody ever seems to come back for the keys, Jeremy says that like the untouched, uncut dish of blueberry pie at the end of the night forsaken in favor of cheesecake, he likes to keep the keys and the pie there just in case. Relating to the tale and in need of distraction, Elizabeth’s ritual of coming in for pie ends in a gorgeous succession of shots with an obvious fairy tale homage as Jeremy leans over and upside down, manages to kiss the remaining traces of pie from the lips of the sleeping, heartbroken Elizabeth before she vanishes to Tennessee to get as many miles as she can away from her bad memories of the end of love. However something unspoken has passed between those pie filled nights and tender conversation, and she continually sends Jeremy postcards and letters from her new life, working two jobs as a waitress in a greasy spoon diner and a bar, both of which are the daily haunts of Strathairn’s Arnie Copeland. Unable to divorce the unfaithful, much younger wife (Rachel Weisz) from whom he’s separated but still madly in love with, Arnie makes a promise every night that he’ll quit drinking, piling his one day AA chips on the bar, but with every time the jukebox record drops Otis Redding’s "Try a Little Tenderness" and Weisz saunters in, that resolution is helplessly abandoned. 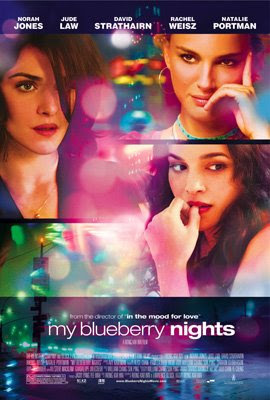 After a tragic middle section, the episodic My Blueberry Nights moves out west to the tale of lady gambler Leslie (Natalie Portman) as she and Elizabeth become a mild Thelma and Louise until life catches up with them both. While Leslie’s story seems like an odd fit with the lovesick tales of woe, it does also concern a nonromantic heartbreak and serves as a nice release for audiences who were squirming in their seats, unfamiliar with the slow Kar Wai pacing and obsessions with the ends of affairs. A Kar Wai fan since Chungking Express who still considers In the Mood for Love to be one of the most romantic films ever made, I was bitterly disappointed by the overly ambitious mess of 2046 that was so awful, it made my loyal film professor and movie going sidekick swear off Kar Wai and decide he would be the one to choose the next several films. And while My Blueberry Nights isn’t in the same league as Chungking or Mood, it’s still intoxicatingly sensual and filled with performers who instinctively feel at ease in Kar Wai’s gorgeous, impressionistic, and unabashedly romantic universe. And hopefully it will make filmgoers not only reach for the nearest slice of pie but hit the shelves of their local movie stores looking for the director’s best. Note: For an in-depth analysis of In the Mood for Love alongside one of the films it influenced, Sofia Coppola’s Lost in Translation, click here for my article.